Gas and bloating are often caused by an intolerance to a certain food item, lack of moisture in the intestines or taking in excessive air while eating. Gas and bloating are not fatal, but are generally a sign of slowed or obstructed digestion. However, severe cases of gas or bloating can cause pain and cramps. Introducing apples into your diet can help to restart and maintain healthy digestion. Eat apples in moderation. 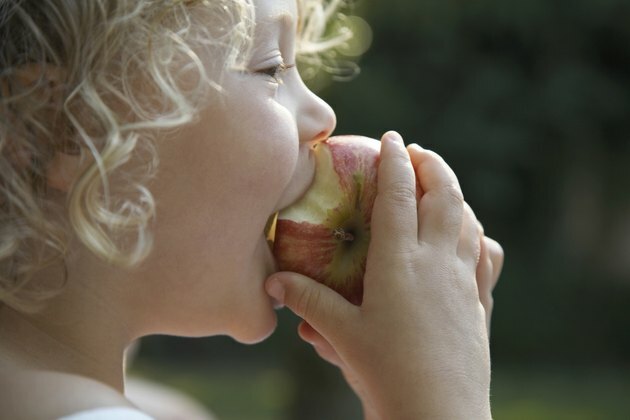 Although helpful, you should be careful when consuming apples because they can cause gas when eaten in excess. If you have gas or bloating, it is OK to eat apples if you know they didn't cause your gas initially. The University of Illinois indicates that eating one apple per day supports good health and is generally not enough to cause any negative symptoms. Eat a small to medium size apple if you are experiencing gas or bloating. It is best to eat the apple with the skin because it contains insoluble fiber, which is most effective in aiding digestion. You can eat it whole or cut it into slices if you prefer. Eat applesauce as an alternative to a fresh apple. The skin of the apple contains the most fiber, but the flesh of the apple can be effective as well. If you prefer applesauce to a fresh apple, you can still obtain relief because applesauce contains natural juices that can help add moisture to your digestive system. Drink water after eating an apple. Water helps speed up digestion and dilute the fiber contained in the apple. Be sure to drink the water or eat the apple slowly to prevent inhaling too much air and causing the gas to worsen. Pick your favorite apple variety. Any type of apple can relieve your gas and bloating. Choose one that you enjoy and can eat regularly.